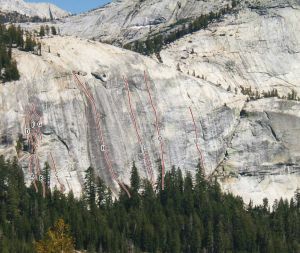 This is a link up of Pitch 1 of Errett Out and Pitch 2 of Bit by Bit, and it is perhaps the best face climb of its grade in Tuolumne. Skip the last bolt on Pitch 1 of Errett Out and traverse right to the anchor on Bit by Bit (easy ramp). Continuing on Bit by Bit is a final fun pitch with a few moves of 5.8. Which SuperTopo guidebooks include a topo for Errett by Bit?